A CMU is divided into lower and upper halves, as shown below. CMP0 and its DIMM slots are outlined in blue. Note that CMP 0 is in the lower half of the CMU. 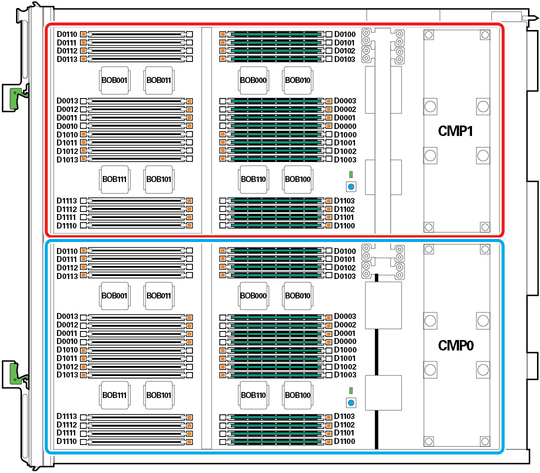 CMP1 and its DIMM slots are outlined in red. CMP 1 is in the upper half of the CMU. For example, this error message identifies faulty DIMMs on two different CMUs. In the first line, DIMM D1111 is located by CMP0 on CMU5. In the second line, DIMM D1113 is located by CMP1 on CMU8.